I never get tired of desert weddings. 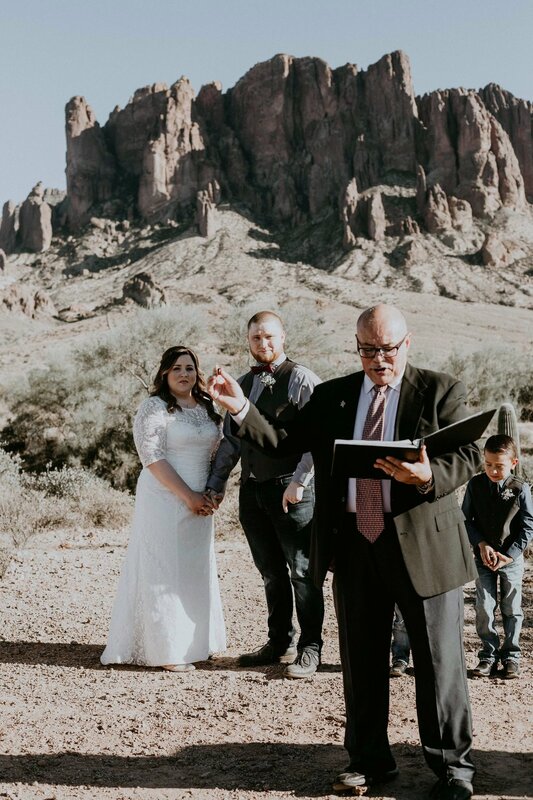 And you can't get any more "one with nature" than marrying at the base of a mountain, Superstition Mountain, to be exact. Matti and Jeff wanted a private (family only) ceremony so they could focus on one another. Once married, and after they took stunning portraits among the saguaros and desert wilderness, they hosted a reception where they dined, danced and donuted (is that a word ?!? !...LOL) with their 100+ guests. My favorite decor element came from the bride's mom. Instead of doing one large candy bar she assembled many candy jars at each of the guest tables which doubled as a centerpiece and party favor (I'm a sucker for ideas that are practical yet beautiful). The whole night you could see pure joy on the bride's face--she found her perfect match and pulled of a perfect wedding!